Here is a drill that will help you to train your players to penetrate either midfield flat defenses or flat back four defenses. Steve Smith has been a men’s college coach that holds an NSCAA Advanced National Diploma and a Doctorate in Physical Education. Area Size: A grid that is 20 X 20 is set up with three dummies (or poles) in the middle as shown. Three groups of three are divided into color groups. Teams: At least two teams but prefer three or more. Time: 20 minutes for full progression to completion. Objective: The objective is to penetrate either midfield flat defenses or flat back four defenses (with modifications). Narrative: Players execute predetermined runs between or in front of dummies to receive from the passing players. 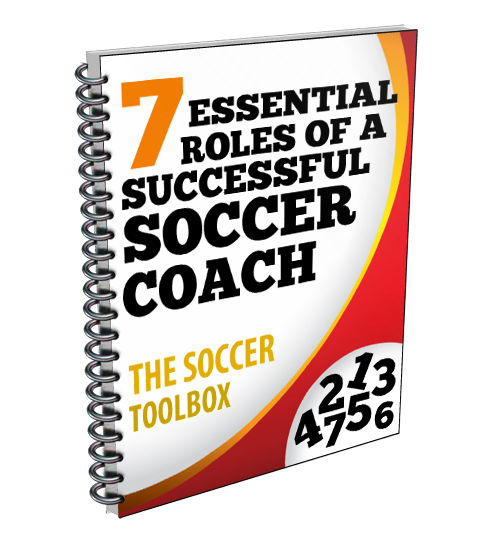 Emphasis and feedback is placed on tactical decision making to penetrate the midfield or back line. Gradually adding pressure will increase the demands of speed of decision making while making great technical touch. Holding runs and staying on side is a key part of the decisions when emphasizing penetrating the back line. 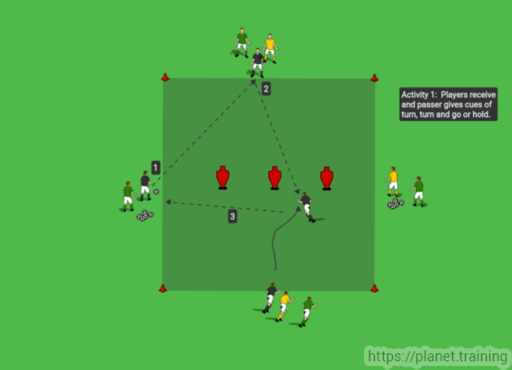 In the first activity, the emphasis is on penetrating the midfield by adjusting runs for the receiver to receive in between the defending dummies. Feedback is given by the passer to receiver to either turn, turn and go, or hold. Then the ball is delivered to the flank and the pattern continues to the next person in line. In the second variation, the receiver posts in front of one of the dummies to receive and double pass back to the initial passer. Then the player must hold and spin off to receive again in between the dummy defenders. Timing is crucial when using this activity to beat a flat four defensive group and stay on side. In the third variation, the activity becomes a SSG by playing 3 v 3 in the given space with the dummies still on the field. Points are gained by either passing or dribbling between the dummies while competing to keep the ball. A final progression (not diagrammed) could be to add full sized goals to the ends of the field and complete the activity by scoring in a 3 v 3 setting. Teams can rotate when they get scored upon or after two minutes of play.